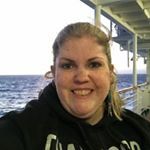 I started I Beat Debt to share my story of getting through the debt management process and to get people talking about money issues. I only have experience of my journey in and out of debt but there is so much more that people want to know about debt and related topics. One of my favourite websites about debt is Debt Camel. Sara Williams started Debt Camel in 2013, having been a volunteer with the Citizens Advice Bureau for many years. She is a debt adviser with the Certificate in Money Advice Practice. 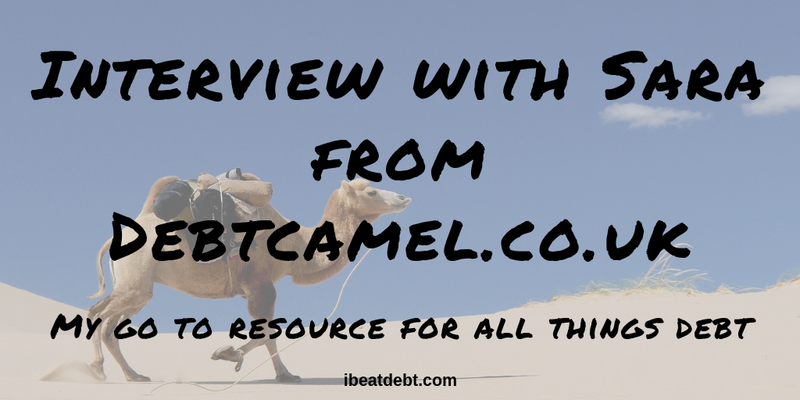 Debt Camel was created to make the serious topic of debt more accessible, whether by signposting or self help resources. I’m delighted that she has agreed to answer a few questions today. There is a lot of stigma around debt and money issues, what would you say to someone who doesn’t feel comfortable talking about their money concerns? A lot of people feel like this. If you talk to a good debt adviser, they won’t be judgemental and you can be sure the discussion is in complete confidence. But it also helps to be able to discuss things with friends and family. Not perhaps in great detail, but so they understand why you want to spend less on a holiday or Christmas this year. And it’s great to be able to ask questions and get some moral support from people who have been in a similar situation. Here the internet can help, with closed Facebook groups and forums such as MoneySavingExpert’s where people can talk about how they are making progress in paying off their debts. Even on a Saturday evening, there will be someone there to chat with. How important is it that everyone, no matter what their financial position, has a budget? I think the more problems or the bigger ambitions you have, the more important it is to have a budget. If you are well off, with the mortgage repaid and good pension arrangement you probably don’t have to worry much about how much you spend on food! Most people think of a budget as having to be written down and then updated, on paper or in a spreadsheet. But it doesn’t have to be so formal. A lot of people with little money find cash budgeting is the easiest approach for things like food and petrol. You know at a glance what you can afford to spend this week. At a time when a lot of people think contactless cards have made it harder to budget, I think we should be encouraging people to find a budgeting app that will work for them. These apps can take much of the hard work out of budgeting. No need to record how much you spent in detail, they will pick it up from your bank account and credit card movements and get very good at allocating those to the right categories. If your Iceland bill is mistakenly allocated to holidays (!) you just tell the app that it is actually groceries and it will get it right next week. Working with clients who are struggling with debt must be hard, what has been your most rewarding moment? I hope most debt advisers have at least a couple of points each week where they have a big grin because a particular case has gone well – I certainly do! A lot of those moments for me have come from the comments left on the payday loan refunds pages on Debt Camel. These refunds mean some people are out of debt for the first time in their adult life. It is deeply satisfying to know that my website has provided them with the template letters and the inspiration to do this. On this website, Vicky has let one man tell his story of getting deep into payday loan debt. a client who was being taken to court by a Water Company – but I saw they had forgotten to send the right letters before they started court action so I was able to persuade them to cancel the court case and agree to an affordable payment arrangement. What is your top tip for anyone with money concerns? Be honest with yourself – and with your partner – about how large your problems are. A lot of people kid themselves that they could stop using their credit cards if they wanted, they just use them because they are just convenient or give loyalty points. But if your balances are going up every month you are heading for real trouble even if your cards aren’t yet maxed out. If you could change one thing about the financial services sector and how it works, what would it be? Can I have two things? I would like the cap on interest charges that has worked so well with payday loans to be applied to on other high-cost debts as well. That means debts such as Provident, guarantor loans such as Amigo, and high-cost lenders such as 118 Money. And also bank overdrafts! If you borrow money you should never have to repay more in interest and charges than you borrowed. I also think lenders should have to do more checks that people really can afford the credit before they give it. Many people look at their credit card or overdraft limits and think – but I only have a below average wage. how could it ever make sense to give me such a huge credit limit? 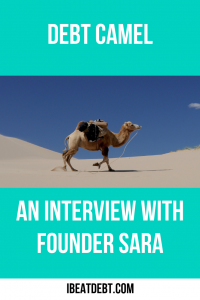 You’ve helped a lot of people get refunds on things like credit cards and loans, what’s the next big thing Debt Camel is working on? The government is planning on introducing a “breathing space” to give people time to sort out a plan to deal with their debts before their creditors go to court or send in the bailiffs. We don’t yet know the details of how that will work, but when it comes in I will be adding a new section to Debt Camel to cover it! And finally, where should people go for help? Don’t go to Google for debt advice! If you do, you may end up talking to a commercial firm, often unregulated, who will make a lot of money by referring you for one type of debt solution. Guess what – they never suggest you go for debt solutions that could be much better for you and your family – because they won’t make them any money. I have a list of trustworthy places for debt advice, depending on where you live in Britain, whether you would like face-to-face advice or use the phone, whether you are self-employed and what sorts of debts you have. Vicky used CAP to help her with her debts – they are on my list!